David Huting is a San Diego-based, world-traveling expert photographer and cinematographer with over 12 years of experience in digital content production. He's carved a career out of capturing the essence of beautiful natural locations on camera and sharing them with the world, in the form of high quality nature videos and fine art photography. Huting's spent the good majority of the last decade exploring and filming many of the planet's most remote, iconic, and exotic locations, with regular releases of new work through his niche art brands Nature Relaxation™ and Epic Wall Art™. Sharing Nature's beauty & subtle yet important message of peace to the world, Huting's Nature Relaxation films are watched over 30 million minutes per month on youtube and are utilized in leading hospitals such as the Mayo Clinic as well as thousands of nursing homes, corporate lobbies, waiting rooms, addiction recovery centers, hotels, casinos schools & more. "Amazing Planet Earth: Nature Relaxation Journey IV"
EpicWallArt.com is the official, exclusive international online art gallery for fine art landscape photographer David Huting, containing hundreds of original, high-quality & high-style custom made wall art pieces designed to add beauty & style to any room - each available in epic sizes up to 100" wide (that's over 8 feet long). 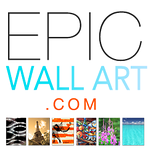 Click Here to View the Complete Epic Wall Art Gallery! FOR MORE INFORMATION, PRESS, PARTNERSHIP, NEW PROJECT AND NATURE VIDEO LICENSING INQUIRIES DOWNLOAD DAVID HUTING'S 2015 MEDIA KIT.